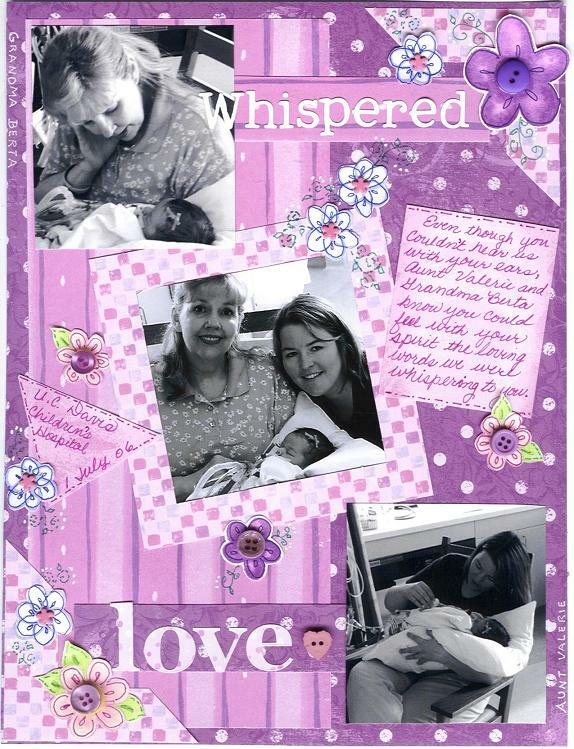 Have you ever had a crisis in your life where scrapbooking helped you get through it? In 2006 my son and his wife had their first child together. Caydence had somehow cut off her own oxygen supply in the last week of Kim's pregnancy and was born with almost no brain function. Having lost an infant child of my own I had so much empathy for them. It was even harder going through it with them than it was for myself. While they were at the hospital and the Ronald McDonald house for those 7 1/2 weeks the thing that got me through this was scrapbooking...every activity (donated by Ronald McDonald House), every photo of Caydence and the family. It was therapeudic for not only me but for the entire family. Yes, scrapping was very therapeutic for me as well around then. My dad passed away at the end of '06 very unexpectedly. Papercrafting was an escape for me. After helping my mom sell his business and do a lot of really crappy stuff like that, I just needed to think of something else. Anything else. And so I'd go into my studio and make cards. Lots and lots of cards. I could focus on one at a time and they didn't take me very much time to do. I also made a mini book for my mom of photos of the two of them for Valentine's Day that year. Oh Berta! YOur pages break my heart! I have a nephew who also lost oxygen at the end of the pregnancy (due to placental abuption). They did not think he would live but he just had his 14th birthday! He is severely handicapped and requires 24 hour care...which is why my SIL and husband chose to place him in a local children's nursing home when he was 3 years old. That was a hard decision for them, but it was the best one. They used to bring him home at holidays, but now he's too big for them to lift at home, so he just stays there. I scrapped a few pages that weren't really about my FIL after he passed, but they were, KWIM? Pictures of the boys with him. A page explaining why black rain boots were an important sign of his presence that first Christmas, that kind of thing. It was therapeutic. Oh Berta that is so sad, I am so sorry. I almost hate writing this, I am not trying to take anything away from Berta, that truely is tragic! I had cancer twice, well actually 3 times, but twice I needed chemo. The first time I had energy on some days and would actually do scrapping. I was on two design teams and I never told anyone at the time, except one girl. anyway the second time, I just had no energy and was very sick from the chemo, I had just gotten on Quick Quotes Dt and as hard as I tried, I just couldn't do it, so I had to resign, I hated doing that, but it wasn't fair to them. They were so sweet to me, very understanding, and very generous, and told me come back anytime before my term was over, but I never did get the chance, took me a long tie recover. FYI just had a catscan, and it is one year cancer free! That is the longest I have gone without cancer in four years. my son is my reason for fighting, and I just kept thinking about him when I was going through it. Donna, I am so sorry you had such a hard time with the kemo. I had breast cancer twice ...2005 and 2008...but chose both times not to do the kemo. The meds I was taking for it really did a number on me however and for a while scrapping was the last thing on my mind, too. I did scrap a couple 'survivor' pages when it was all said and done. Congrats on the one year cancer free!! It's rough isn't it? Really makes you think about life, I guess anytime you go through something life threatening makes you think differently about life and what you have, my priorities are a lot different now. Glad you are a survivor too! Yeah!